The amount of anger over the killing of one lion, Cecil, currently expressed on the Internet and within the news media, baffles me. I have not spent much time on Twitter over the past few days, but a number of friends on Facebook have voiced their outrage about the killing of Cecil. Most of these same friends have never voiced their outrage over the killing of innocent men, women, and children by the Islamic State, Boko Haram, al-Shabaab, or others, simply because they are Christian. 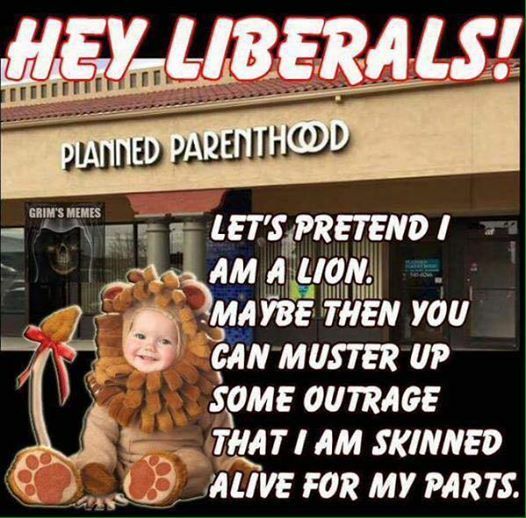 Nor have they voiced their outrage over the killing of unborn children simply because their mother's find them inconvenient. 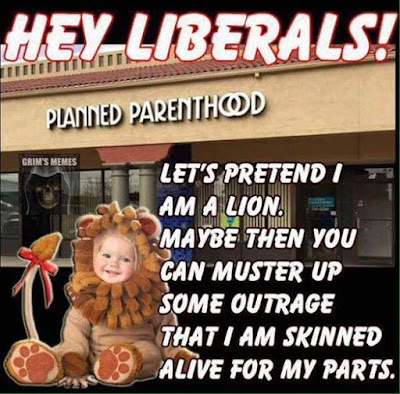 They have also not voiced their outrage over Planned Parenthood's recently exposed selling of baby parts for profit. Why? It cannot be because they are ignorant of these outrages against the dignity of the human person; I share such stories frequently and often. At the very least, I suppose I should be grateful none of my friends have called for the hunter's death. A sense of deep communion with the rest of nature cannot be real if our hearts lack tenderness, compassion and concern for our fellow human beings. 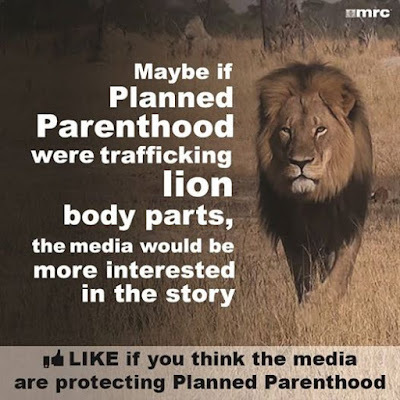 It is clearly inconsistent to combat trafficking in endangered species while remaining completely indifferent to human trafficking, unconcerned about the poor, or undertaking to destroy another human being deemed unwanted. This compromises the very meaning of our struggle for the sake of the environment. It is no coincidence that, in the canticle in which Saint Francis praises God for his creatures, he goes on to say: "Praised be you my Lord, through those who give pardon for your love." Everything is connected. Concern for the environment thus needs to be joined to a sincere love for our fellow human beings and an unwavering commitment to resolve the problems of society (91). Is there are a greater problem confronting society than the murder of unborn children or murder of Christians simply because they are Christians? I do not think so. Raise your voices! The March of Dimes is "neutral on the subject of abortion"
It has not happened since I have been back in the United States of America yet this summer, but in years past the cashiers at some of the stores I shopped at would ask me a simple question: "Would you like to make a donation to the March of Dimes to help save babies?" No, I would not. The March of Dimes helps fund Planned Parenthood, the leading provider of abortions in this country and killing babies seems a very strange way to save them. I was born six weeks premature and I do not support the March of Dimes. The cashiers always responded with expressions of surprise and sometimes even shock. I do not blame the cashiers for being surprised. What the March of Dimes does with monies collected under the pretense of a mission to "help moms have full-term pregnancies and research the problems that threaten the health of babies." Nothing threatens the health of a baby quite like abortion. For its part, the March of Dimes maintains that it has no direct connections to Planned Parenthood, though local affiliates of the March of Dimes have made donations to Planned Parenthood and insists that "The March of Dimes is neutral on the subject of abortion." How one can simply remain "neutral" on the killing of children in their mothers' wombs is simply beyond me. If the March of Dimes cannot see that abortion poses the greatest threat to the life of unborn babies, it is unworthy of your donations. Bishop Paprocki on Planned Parenthood videos: "We should be shocked and appalled at this moral depravity"
Responding to the horrific activities of Planned Parenthood exposed in recent days in a series of undercover videos, His Excellency the Most Reverend Thomas John Paprocki said in a video of his own that "we should be shocked and appalled at this moral depravity." After describing the revelations detailed in a series of recently released videos, the Bishop of Springfield in Illinois prayed that we might "never grow apathetic to the plight of unborn babies" and that "government officials act decisively to put an end to this gruesome practice." How anyone can watch what Planned Parenthood does in its clinics and not be disgusted and heart-broken is quite beyond me. Let us join our prayers to those of Bishop Paprocki. Having already donated more than $3 million in humanitarian aid to persecuted Christians and other religious minorities in the Middle East, the Knights of Columbus will expand its efforts even further with a national campaign to raise funds and foster awareness of the terrible suffering of Christians and others in the Middle East. Please be sure to include "Christian Refugee Relief" on the memo line. One hundred percent of all donations directly supports humanitarian assistance and raising awareness for persecuted Christians and other religious minorities, especially in the Middle East. Donations are tax deductible to the extent allowed by law. Knights of Columbus Charities, Inc., is recognized by the IRS as a charitable organization under section 501(c)3 of the Internal Revenue Code. Summer vacation is always a good time to spend extra time with books, especially with books you've long wanted to read. So it was that I delved with great interest into a recently published collection of essays titled, The Arthur of the Italians: The Arthurian Legend in Medieval Italian Literature and Culture (a generous gift from a good friend). Curiously (or not), I'm the only person to have added this book to my collection over at Library Thing. When I first became aware of the book a few months ago, I knew I wanted to read it to learn more about the Otranto mosaic (about which I've written briefly before) and the sword of Saint Galgano (about which I've also written before). Though the book provides me with no new information or insight into the mosaic at Otranto, it did answer a question I've long had about the Sword in the Stone (which, according to the legends, was not named Excalibur [which came from the Lady of the Lake], but Caliburn). Saint Galgano was born in the castle at Chiusdino, a short distance away to the south of Siena) somewhere in the middle of the twelfth century. We have several historical documentations of him, so there can be no question of his existence even if his dates are not so certain. He died on November 30th, probably in 1181, but some texts say in 1183. Sometime afterwards, riding from his native Chiusdino to nearby Civitella, he noticed that at a certain point his horse obstinately stopped. Galganus let the reins hang loose on the horse's neck, and it carried him up to the top of the Montesiepi hill. Then and there he chose the hill for his dwelling-place and dismounted. Either not finding or not wanting to seek wood to make himself a cross, he unsheathed his sword - crucifom, as swords were in the twelfth century - and thrust it into the ground. The sword struck deep into the rock and afterwards could not be removed. That stone, topped by the sword-cross, served as an altar and, more significantly, as a symbol of Calvary. Before it, the aspiring knight lived and prayed as a hermit until the end of his life - a short period, as his biographers say that he died less than a year later. 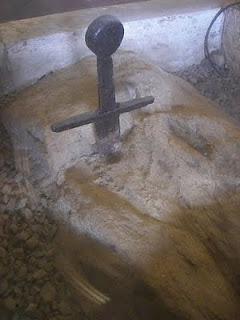 I have long wondered which came first, Galgano's sword or the Sword in the Stone of the Arthurian legends. Before reading this essay, I could not easily or clearly determine the answer. Ultimately, the name Galgano/Galvano and the echo of the 'sword in the stone' - attested since the end of the twelfth century in the written sources, but present as a material and concrete datum further back than we can pinpoint - could actually suggest an idea that was born in the episcopal-seigneurial court of Volterra and in the Cistercian order during the Duecento, when Arthur was well known, to popularize the 'sanctuary' of Montesiepi and the adjancent abbey [built in honor of Saint Galgano]. Unfortunately, he ends his essay with this sentence. Arthur proved that he was destined for the throne by removing the sword held fast in a tree or anvil; Galganus by contrast abandoned the world of sin and signalled [sic] his conversion by fixing his sword in the stone and thereby renouncing his arms, to worship the cross whose form the sword suggests. Let us strive to follow Saint Galgano's example. He stopped pursuing the glory of this world to pursue the glory of heaven. Through his intercession, may we do the same. Why are we not at least feeding our persecuted brothers and sisters? This past weekend, I preached once again about the plight of our persecuted brothers and sisters, principally in Iraq and Syria, but also throughout the world. I was stunned after the Saturday evening Mass when one of the parishioners thanked me for my words because he did not know anything about the sufferings of Christians in the Middle East and in many parts of Africa, sufferings which have been happening for years. I've known - or at least suspected - for a long time that most Americans are more concerned with who won Dancing with the Stars last night or the score of the recent sporting event than they are with matters of true import. Even so, his words caught me off guard and left me speechless. And very sad. Too many people simply do not care about what is happening. They do not realize that we are all one in the Body of Christ. They do not realize the danger what is happening now poses to the future. They have learned nothing at all from the past (if they are even aware of history). Overall, the refugees’ situation is getting worse as people are feeling crestfallen because they realise they will be unable to return to their homes in Iraq or Syria, he added. “Now everyone is tired,” Patriarch Twal said. “The parish priests are tired, the donors are tired, the people are tired and losing their enthusiasm. At the beginning, they were happy to help. But now [they look at] the future [and see no end]. Caritas does not have the resources to give three meals a day to each person” [more]. How can it be that the universal Church is not providing even three meals a day to our brothers and sisters who are greatly persecuted because of their faith in Christ? There is no excuse for this lack of concern and sustenance! What are we waiting for? Why are we not helping? Why are we not talking? Our brothers and sisters cannot wait for us. Please, help today! Give what you can and remember them in your prayers! Today the Holy Father Pope Francis named three Auxiliary Bishops for the Archdiocese of Los Angeles. Two of the Bishops-elect are priests of the Archdiocese of Los Angeles, Monsignors Joseph V. Brennan and David G. O'Connell. A third Bishop-Elect, however, is a priest of the Archdiocese of Chicago, Father Robert E. Barron, Rector of Mundelein Seminary and founder of Word on Fire. A media savvy man of great intellect, energy, and enthusiasm, Bishop-elect Barron is a great preacher and witness of the Catholic faith to the culture through his popular YouTube videos and through his Catholicism series. His is a clear and consistent voice seeking to demonstrate the reasonableness of the faith. I looked at the man on the left and thought, "Is that Bob Barron?" The picture looks like him, but it's a very poor photograph. After checking the daily bulletin from the Holy See, I learned it is indeed him. Having been a student of Bishop-elect Barron when I studied at Mundelein Seminary, I am particularly pleased with his appointment and look forward to seeing how he presents the faith to the people of the City of Angels. Yesterday was, in the United States of America, National Ice Cream Day. 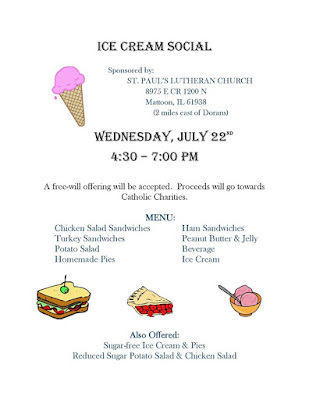 If you missed it yesterday - or even if you didn't - and are in the area of Mattoon (Illinois), you can enjoy a bowl of ice cream on Wednesday while helping Catholic Charities. Earlier today I shared Chris Hazell's review of Pixar's Inside Out in which he reflected on God's gift of sadness. "Looking more intently, he saw under the sorrow a great joy: a fountain of mirth enough to set a kingdom laughing." The quote seemed familiar to me, but I could not quite place it; at the very least, I knew it certainly sounded like Tolkien. 'You did indeed!' said Gandalf, laughing suddenly; and he came and stood beside Pippin, putting his arm about the hobbit's shoulders, and gazing out of the window. Pippin glanced in some wonder at the face now close beside his own, for the sound of that laugh had been gay and merry. Yet in the wizard's face he saw at first only lines of care and sorrow; though as he looked more intently he perceived that under all there was a great joy: a fountain of mirth enough to set a kingdom laughing, were it to gush forth. We might say that Gandalf's joy was something like a volcano, just waiting to erupt. With how many of us is this the case? The film masterfully explores the danger of avoiding sadness and exhausting joy, a theme we can see in our culture without much eye straining—an inordinate drive to secure emotional happiness at all costs, avoiding, ignoring, or destroying all obstacles that could hinder it. Yet, as we witness in the film, there is a necessary “growing up” that reveals not only the benefit of sadness, but also the inescapable need for it to allow a deeper sense of richness in our lives and, paradoxically, a more lasting joy. Far too many people today are - it might be said - obsessed with the outward appearance of joy, but interiorly they are bereft of joy; we have become, as a society, so uncomfortable with sadness, a necessary and life-giving emotion, that we would rather fake being happy than acknowledge we are sad. We refuse to be led by sadness to a joy beyond imagining. As one simple example of this, the most common thing I hear from parishioners is this: "You need to smile more," or some variation of it. These are the ones so concerned with exterior joy that they do no see what Pippin saw under Gandalf's care and sorrow. I do not have a natural smile on my face and if I were to walk around smiling it would not be a sincere smile. This, however, does not mean that I do not know joy. It means, rather, that my joy is, like Gandalf's, hidden within sorrow and those who know how to look will see it; these are the ones who say to me, "You have a beautiful smile." I've always taken this to mean that my smile is sincere; sincere smiles are always beautiful. I do not think my joy can set a kingdom laughing, but it can certainly set a room laughing, but only after people let sadness lead them to the joy waiting to burst forth. A few weeks ago, I saw Pixar's newest movie Inside Out with my brother and his family. It is a movie I found deeply moving and its focus on the interplay between Joy and Sadness I found intriguing. I knew the movie was on to something because, well, it just felt right. The important role of sadness seemed comfortable and natural, and rang true with what my melancholic personality knows and values. While society today tells us to avoid sadness at all costs, we melancholics often feel quite at home in sadness (which is not the same as depression). Pixar gets it right. And perhaps more than just a necessity, sadness may be one of the greatest gifts for which we thank God in the life to come. For in our sadness—in our suffering—we can experience the joy of knowing God’s unending mercy and love for us. Be sure to read the whole thing and don't be afraid of sadness. Turkey v Islamic State v Kurds: What's going on? 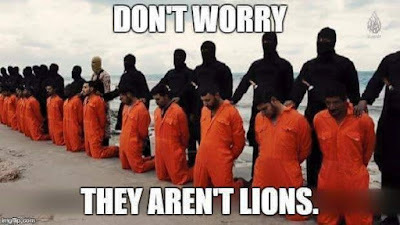 UPDATE (07-23-15): Is This the End of Christianity in the Middle East? “ISIS Vows to ‘Fill The Streets Of Paris With Dead Bodies'"
UPDATE (07-20-15): After Four Months, Why Are 20 Chaldean Iraqi Christians Who Fled ISIS Still Detained By Immigration Officials? C-3P0, Han Solo, and Pope Francis?